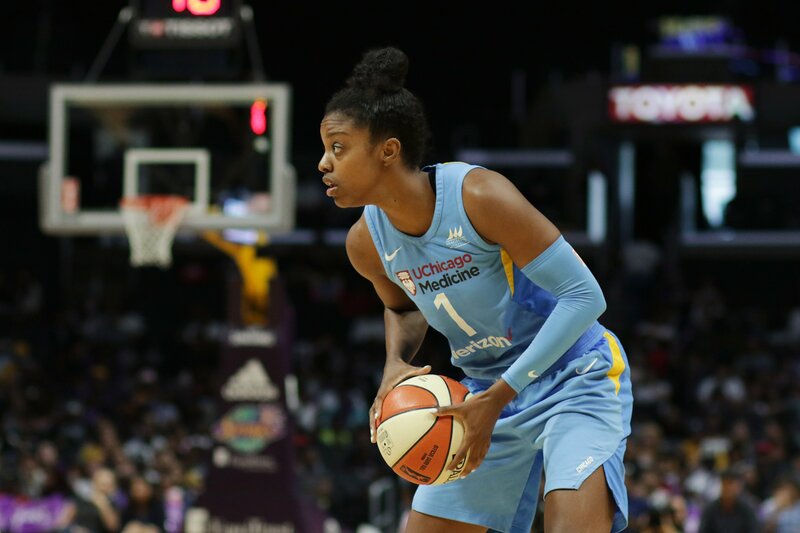 Diamond DeShields in a game against Los Angeles earlier this month. Photo by Maria Noble/WomensHoopsWorld. 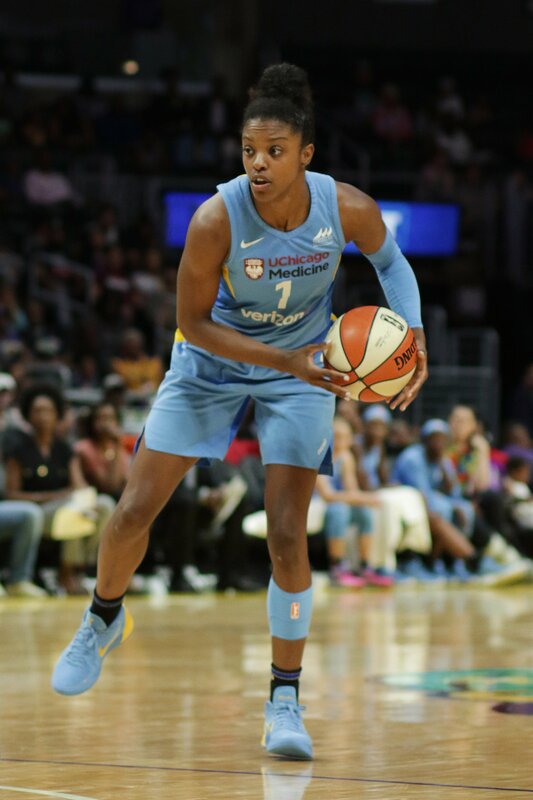 Watching a Chicago Sky game this season, it is easy to mistake Diamond DeShields for a veteran. She slashes to the basket with confidence, sinks silky jumpers without hesitation, makes 85 percent of her free throws and plays solid defense. DeShields anticipates well and has the speed and athleticism to get to the right spots on the floor in time, usually before her defender arrives. The 6-1 rookie guard made her WNBA debut a month ago by scoring 18 points and grabbing eight rebounds, to the surprise of no one. Thirteen games into the 2018 season, and despite her team’s struggles to win, DeShields is an integral part of the Chicago franchise. 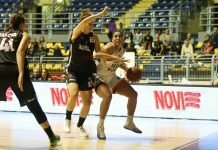 She is putting up 12.3 points per game – second-most for the Sky and 26th in the league – and averaging almost five rebounds in 24.8 minutes an outing. The No. 3 draft pick has scored in double-digits in seven match ups, including a career-high 25 points, and has started every game but one. Chicago coach Amber Stocks said DeShields’ impact on the team was immediate. Yet, from the lens of DeShields, who comes from a family of athletes and has always had high expectations for herself, she has plenty to work on. If DeShields’ smooth ascension in the professional ranks was expected, nothing about the pathway for the gifted athlete, from a family of athletes, has followed a conventional script. The self-described “unicorn” has come to the WNBA in a way that is just as unique as the person she is. As a child, DeShields tried just about every sport, from bowling to golf to softball to archery, and her talent was evident in whatever she attempted. Her father, Delino DeShields Sr., was a Major League Baseball player, and she grew up around sports. She was also heavily-influenced by her mother Tisha, who was a star heptathlete at the University of Tennessee. DeShields had high aspirations from the beginning. DeShields’ first sport love was tennis, and for a time she trained with Richard Williams, father to superstars Venus and Serena Williams. She contemplated making tennis her focus, but ultimately, the team aspect of basketball won her over, as it better suited her personality. Her original goal remained the same. “When it came time for me to pick a sport, I still wanted to be the best to play this game,” DeShields said. Diamond DeShields yawns at a Duke home game in 2014. AP stock photo. She took her skills to Norcross High School, outside of Atlanta, and guided the team to three state titles during her tenure. DeShields was part of a celebrated North Carolina recruiting class that made an immediate impact there. In what might be her most memorable game as a Tar Heel, DeShields stood on the sidelines at Duke’s Cameron Indoor Stadium, waiting to inbound the ball. 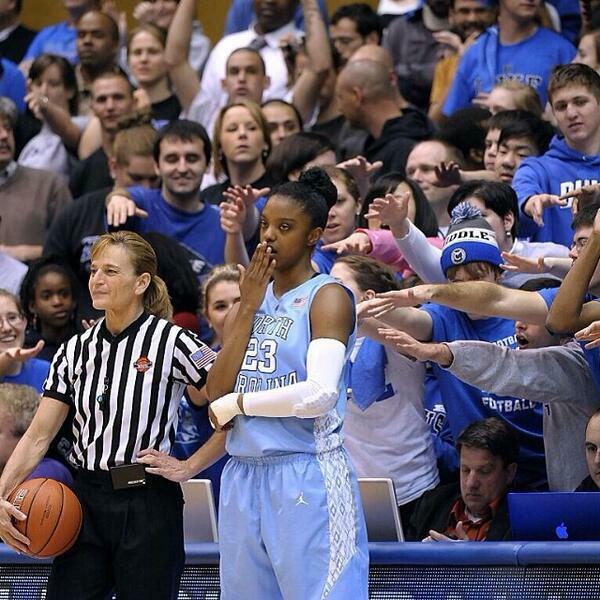 As dozens of Blue Devil fan arms extended towards her while they heckled, DeShields yawned to show her indifference. Her confidence, she said, came quickly after she started playing sports. Her self-assurance in basketball also came from experience, which began in a rec league when she was nine years old. But her brother said she has never been one to cross the line from confidence to arrogance. “She knows the talent that God has given her, and she has always done a good job using her platform as an athlete to help and inspire other girls,” Delino DeShields said. After one year at North Carolina, DeShields transferred to Tennessee, where expectations were high that she would guide the program back to national prominence. Yet, despite being the leading scorer for the Lady Vols for two years, the team didn’t advance past the Elite 8. After initially pledging to return for her redshirt senior year, though she had already earned her degree, DeShields decided a year ago this week to forego her last season of eligibility. She went to Turkey over the winter and played for Cukurova, where she averaged 16.5 points per game. Not only did she feel that the professional experience helped develop her game and prepare her for life in the WNBA, the time away gave her perspective. She said she has no regrets. Stocks visited DeShields overseas and had built a relationship with her before the draft. Diamond DeShields passes the ball to teammate Gabby Williams. Photo by Maria Noble/WomensHoopsWorld. The 4-9 Sky’s season has been challenging, as starting center Stefanie Dolson missed seven games with an injury, leaving the rest of the team to pick up the slack. They snapped a six-game losing streak Sunday with a win over the Phoenix Mercury. DeShields scored 16 points. 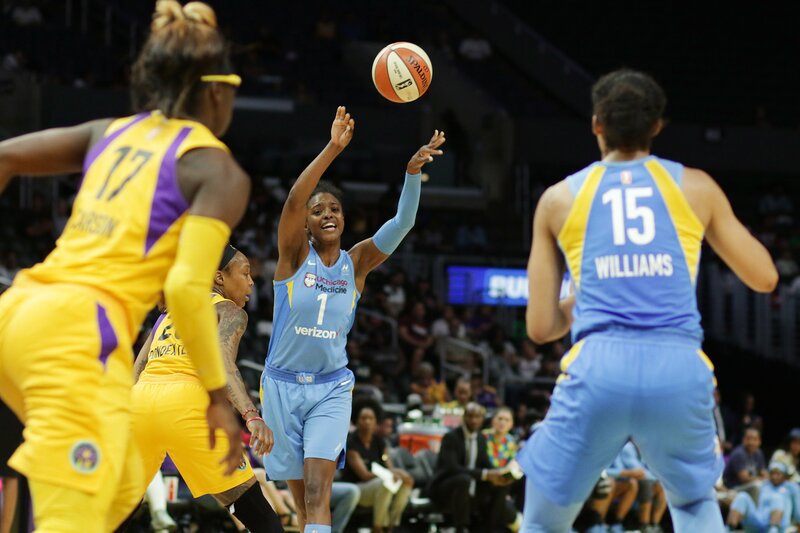 Former Tennessee All-American Candace Parker, whose Los Angeles Sparks team hosted Chicago two weeks ago, said DeShields is going through a rite of passage for rookies. Parker said DeShields has unlimited potential. DeShields is targeting her scoring right now. On the surface, DeShields’ off-court persona doesn’t seem much different from her game face. The 23-year-old smiles judiciously and speaks steadily, without an overt amount of voice intonation. But her eyes are filled with warmth – especially when speaking about her family, with whom she is close – and in particular Delino, who plays Major League Baseball for the Texas Rangers. Their mother has referred to them as twins, though they were born two and a half years apart. And among the things they shared was feeling the weight of high expectations. Eventually, the siblings had an adult discussion. 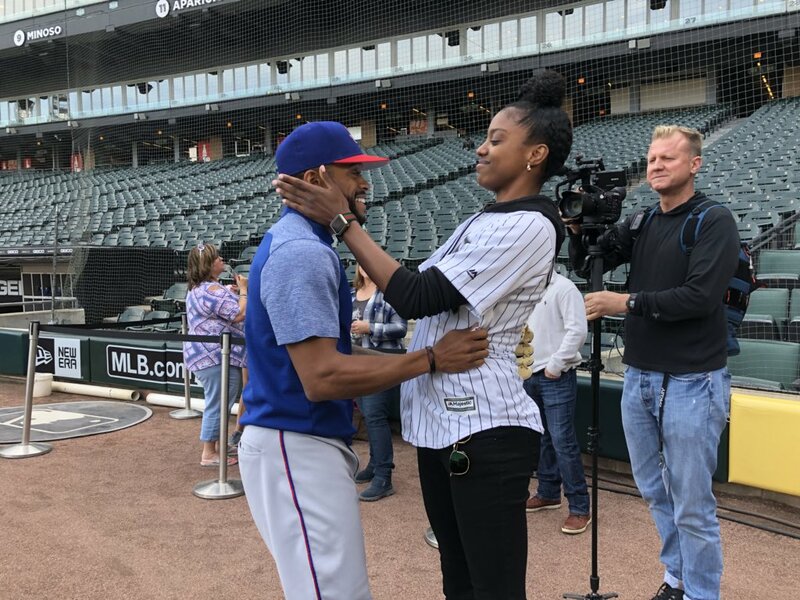 Delino DeShields Jr. and Diamond DeShields hug before a Chicago White Sox game last month. Photo courtesy of Chicago White Sox. The DeShields were reunited in Chicago last month, just prior to the start of the WNBA season, after not seeing each other for a year. They smiled and embraced, and then DeShields threw out the first pitch before her brother’s team took the field. Las Vegas Aces forward Dearica Hamby said DeShields’ warmth comes from her mother, who took Hamby in for her senior year in high school so she and DeShields could play ball together. “They both have very big hearts,” Hamby said. DeShields also has a great sense of humor, explaining that she “never takes anything too seriously.” And she is so even-tempered that she can deliver the funniest story about herself with a deadpan expression. Hamby said her friend has often been misunderstood. “I just feel like there’s never been another person like me,” she said. She has never been troubled by those unnerved by her confidence in sport. DeShields said the WNBA is like a family, and credited Sky veterans Allie Quigley and Alex Montgomery for mentoring her. Diamond DeShields. Photo by Maria Noble/WomensHoopsWorld. When her playing career is someday said and done, DeShields wants to make a mark.